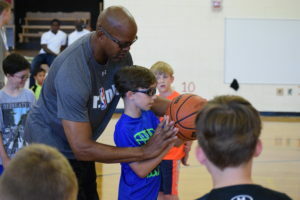 As part of a new partnership with Halftime Sports, Grizzly Sports & Entertainment Marketing brought former NBA All-Star and 3-Point Champion Dale Ellis to youth in Alpharetta as part of a shooting camp on June 9-10. Ellis, a Georgia native, starred for the Seattle SuperSonics in the late 1980s, with his scoring average topping out at 27.5 point per game during the 1988-89 season. Ellis was selected to the NBA All-Star Game during the same season, and scored 27 points for the West. Ellis will do additional events for Grizzly and Halftime Sports in coming months.